Well, there are tons of classical music myths that need busting. Classical music isn’t just for old people. And the musicians aren’t all stuck up, even if we treat our instruments like actual babies. Before we can discuss classical music myths, we need to discuss classical music. I guess our first myth is that classical music is very narrow. Classical music encompasses many different genres of music. Baroque music doesn’t sound very similar to romantic music, for example. Works by J.S. Bach are very different from the works of Stravinsky. And the classical music of today is even more varied. Some modern day composers use tons of extended techniques and others take inspiration for the music of other countries. Classical music refers to any type of music that evolved from the western classical tradition. And that’s a lot of music. You should care about classical music, because there’s so much variety. Even if you think classical music is boring, you’re bound to find something you like. No two time periods of music sound the same, and no two composers write the same. So give classical music a chance. One of the most pertinent classical music myths is that it’s all old. But there are plenty of classical composers alive and working today. Someone is probably composing classical music as you read this. So while Bach, Beethoven, and Brahms all wrote classical music, they certainly aren’t the only composers. Classical music is often misunderstood, even by music students. There are tons of classical music myths that can make it seem stuffy and inaccessible. So, without further ado, let’s break some of the most pertinent classical music myths. Like I mentioned, there are tons of living classical music composers. New pieces get written each year which is pretty awesome. I assume the reason for this classical music myth has to do with orchestras. More and more orchestras are moving from full time to part time, or they’re shutting down completely. This means a lot of classical musicians have to rethink their career paths. But there are tons of other ways to be a classical musician outside of orchestras. So, no. Classical music isn’t dead. And with a more diverse pool of composers, classical music has so much more to offer. Classical music is very much alive and flourishing. If you think classical music is dead, you probably also think it’s boring. Well, I want to tell you that there is much more to classical music than symphonies. Have you heard Marquez’s Danzon No. 2? If that doesn’t make you want to dance, maybe you’d like Sibelius’s Finlandia. Classical music isn’t all one and the same. There are tons of composers and sub-genres, so you’re bound to find something you like. This has to be one of the worst classical music myths. Most of the classical musicians I have met and worked with have been super nice and down to earth. I’m sure there are some stuck up classical musicians out there, but every group of people is going to have some bad apples. Many classical musicians are nice, and we want to share our music with you! No. Just…no. Unless a musician lands a full time orchestral job, they’ll have to do a lot more than play their instrument. As a musician, I practice, have rehearsals, and I work as a freelance writer. My day is much more than playing music. Majoring in music involves much more than all-day band or choir. You have to learn music theory, music history, and more. Many professional musicians also teach or write or something. And if you’re a freelancer, you have to constantly work to get gigs. I can’t learn/play/enjoy classical music. If you want to learn how to play music, get out there and do it. No one’s stopping you…except maybe your bank account. But anyone can listen to classical music and enjoy it. If you do have a bit of money to spend on an instrument, there are tons of affordable instruments out there. You can find used instruments or rent from a music store. And plenty of musicians teach themselves, at least for a while. If you want to learn about classical music and the flute, feel free to browse this website and blog. I have tons of blog posts and digital downloads, and one of my goals is to make classical music more accessible. 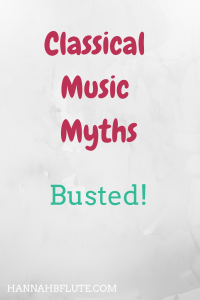 There are tons of classical music myths, but that’s just it. They’re myths. Classical music has something for everyone, you just have to give it a chance. What other beliefs do you have about classical music? Leave them in the comments, and I’ll see if I can change your mind. Previous Previous post: How to Clean Your Flute: What, When, Why?